This lovely diamond earrings 0.25 ct white & black diamonds. Opposites thus only exist in relation to each other. All diamonds are sparkling and 100% natural. 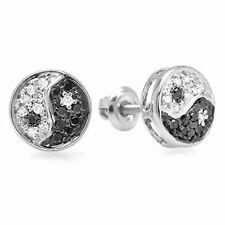 The black diamonds used in this item are enhanced for color. This popular matching pair of earrings features 20 round natural diamonds. All diamonds are pave set in 14k white gold. Each earring is secured by 14k white gold push lock backs. .30ct total diamond weight. Founded in 1978, Amour retains facilities around the globe. This item is part of the Amour Essentials Collection. J-K diamond color, I2-I3 diamond clarity. 1 round prong-set diamond. Crafted in 14-karat white gold. Diamond Dangling Earrings - Diamond Dangling Earrings 0.25 ct tw in 14K White Gold. | TriJewels. This is a Beautiful 0.25 ct tw Dangling Earrings With April Birthstone Diamond, representing Love. Diamond Dangling Earrings. A pair of round brilliant cut diamonds are securely set in 14k white gold basket setting. Each stud includes 14k white gold push-backs for extra comfort. .25ct total diamond weight. > Diamond carat weight (ct,tcw,cts) and product total weight (T.W.) is approximate weight. Diamond Carat weight is 0.02 ct - 0.15 ct depending on diamond size.all diamond grading is approximate. Total Carat Weight : 0.25 ct(0.22-0.28). This lovely diamond earrings 0.27 ct white diamonds. All diamonds are sparkling and 100% natural. SKU # K3774-10KW. 14k White Gold 1/4ct TDW Martini Style 4-Prong Solitaire Earrings H-I I2-I3. These stunning diamond solitaire earrings from the Amour Collection feature white diamonds weighing a total of 1/4 carat. These classic earrings secure with butterfly backs. Double your style with these unique double hoops! Round-cut diamonds totaling 1/4 ct parallel unadorned bands all set in 10K white gold. Pieces measure 7/8 by 1/8 inches. 1/4 ct Round-Cut Diamonds Color H-I, Clarity I2-I3 10K White Gold Measure 7/8 by 1/8 Inches . This pair of cluster brilliant cut diamond earrings are prong set in a 14k white gold setting. Earrings are secured by screw backs and is a total diamond weight of 0.25ct. Length: 5.3 MM. Stone Weight: 0.25. Details: Total Weight: 0.7 Grams | Total Carats: 0.26 Carat | Setting: 10K, white-gold | Main Stone: 3.25 mm (0.1in) | Width: 3.25 mm (0.1in) | Item Length: 3.25 mm (0.1in) | Diamonds: Natural, Real | Color: Blue, Shape: Round, 0.26 cttw, Clarity: I2/I3 | Color diamonds are heated and/or irradiated to permanently improve color | Period/Style: Modern | Condition: New | Includes: Gift Pouch/Bag. We also have a wholesale loose diamonds in all sizes and in Natural Brown and color enhanced. man costs. best as we can. All our diamonds are natural earth mined and 100% natural. This lovely Jackets feature stones in Prong setting. All stones are sparkling and 100% natural. Only the jackets are sale for stud earrings. Can be fit with 4 mm Round shape Center Diamond. SKU # K1960-10KW. 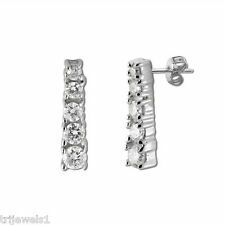 BEAUTIFUL PROMO 1/4 CT TOTAL WEIGHT 14K WHITE GOLD DIAMOND STUD EARRINGS. DIAMONDS ARE SET IN 4 PRONG 14K WHITE GOLD FRICTION BACK. CUT: ROUND BRILLIANT. NUMBER OF DIAMONDS: 2. Category Type:Diamond Cluster Earring. Diamond Clarity / Color. Diamond Carat Weight. Combined diamond weight of 1/4 carats total weight represents a range of 0.23 - 0.28 cts. 10kt White Gold. Gold Purity & Color. SINGLE 1/4 Carat Diamond Stud Earring14K.W.Gold !!! CLEARANCE BLOW-OUT!!! 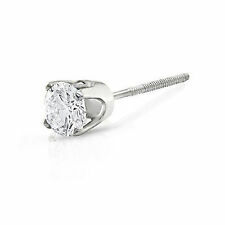 SINGLE 1/4 carat diamond stud earring14k. White gold. Diamond stud earrings go a long way. They can be worn with any outfit and never go out of style. Round diamond. CLEARANCE BLOW-OUTSIDE. 14k white gold. With their simple yet elegant look, diamond studs will never go out of style. These classic stud earrings feature 2 genuine diamonds weighing 1/8 carat each, for a total weight of 1/4 ct. The diamonds are prong-set in 14k white gold,the earrings will add a touch of class and elegance to any outfit. For a detailed look with big impact, choose these stud earrings that feature groupings of smaller diamonds. Round-cut diamonds, totaling 1/4 ct, are set in groups atop each stud for a shining composite-head look, crafted in gleaming 10K white gold. Pieces measure 3/16 by 3/16 inches. Composite Design 1/4 ct Round-Cut Diamonds I-J Color, I2-I3 Clarity 10K White Gold Measure 3/16 by 3/16 Inches . This lovely piece of jewelry is a wardrobe must have. SKU # DR1201-1898. Amour 10k White Gold 1/4 Ct TDW Diamond Hoop Earring H-I I2-I3 This fabulous hoop earrings from the Amour Collection feature round white diamonds. This classic pair is set in 10-karat white gold and are secured with clip-in backs. 14kt White Gold. Category Type:Diamond Stud Earring. Diamond Carat Weight. Gram Weight. Combined diamond weight of 1/4 carats total weight represents a range of 0.23 - 0.28 cts. Diamond Clarity / Color. 1/3ct Diamond Stud Earrings set in 14K white gold. The round diamonds are J-K in color and I2 in clarity. The earrings feature friction backs for ease of use. 1/4ct TDW Round Natural Diamond 14K White Gold Stud Earrings, H-I, I2-I3. Style Stud. Type Earrings. Main Stone Diamond. Diamond Color H-I. Fancy Diamond Color Prong. If the information does not match, your order may be canceled. 14kt Yellow Gold Unisex Round Diamond Solitaire Stud Earrings. 20 Cttw. I2-I3 clarity; Black color Genuine Diamonds with White diamond center. 10kt White Gold. Details: Total Weight: 0.7 Grams | Total Carats: 0.25 Carat | Setting: 10K, white-gold | Main Stone: 3.25 mm (0.1in) | Width: 3.25 mm (0.1in) | Item Length: 3.25 mm (0.1in) | Diamonds: Natural, Real | Color: Blue, Shape: Round, 0.25 cttw, Clarity: I2/I3 | Color diamonds are heated and/or irradiated to permanently improve color | Period/Style: Modern | Condition: New | Includes: Gift Pouch/Bag. Category Type:Diamond Hoop Earring. Diamond Clarity / Color. Diamond Carat Weight. Our huge collection of products includes rings, fashion and wedding bands, bridal jewelry, pendants, gems and much more! Diamond Information. White Gold. Best Viewed With Internet Explorer Browser. We are very proud of our Service and Quality. and we will take care to make sure you are 100% satisfied. We will be happy to correct any problem your have with. This lovely stud Earrings are beautifully hand set in prong setting. The diamonds are real and sparkling. SKU # K3175-10KW. 10kt White Gold. Category Type:Diamond Cluster Earring. Diamond Carat Weight. Gram Weight. Combined diamond weight of 1/4 carats total weight represents a range of 0.23 - 0.28 cts. Diamond Clarity / Color.